Vegetarian bar food is usually relegated to deep-fried cheese sticks, no rx greasy potato skins without bacon and mayo-filled spinach and artichoke dip. Those are fine and dandy, but sometimes you want something a little healthier, and sometime you just want some bright orange, tangy and spicy buffalo sauce. I came up with this recipe by accident. After discovering potato pizza, I’ve been dying to make a version with sweet potato. So, that was all planned. I was going to put pancetta and goat cheese on it and call it a day. But then I spied the half-full bottle of buffalo sauce taking up precious space in my refrigerator. I knew the sweetness of the potatoes would be perfect with the spicy, vinegary tang of the buffalo sauce. And once you’ve got buffalo in the mix, you’ve got to top it all off with blue cheese. This pizza is nothing short of awesome. The potatoes give it a sweet and creamy base, the buffalo sauce gives it a hefty kick and the blue cheese adds deep flavor and a little decadence. Even if you’re not vegetarian, I can’t imagine a better pizza for a Friday night or Sunday afternoon. The perfect accompaniment to a frosty pint of beer. If you have a pizza stone, preheat it under your ovenâ€™s broiler. If you donâ€™t, preheat the cookie sheet youâ€™ll use. While your pizza stone heats, grate the potato with a box grater, or simply mash it up with a fork. Roll out your dough as thinly as possible. Sprinkle the cornmeal on the heated stone or cookie sheet, then top it with the dough. 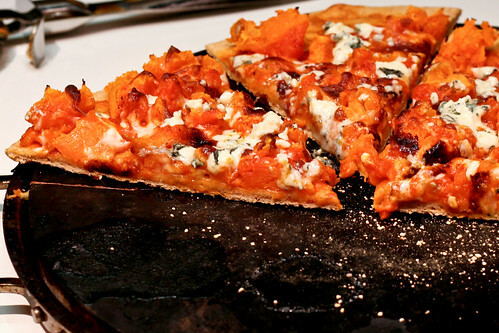 Brush on half of the buffalo sauce, then cover the pizza with the sweet potato as evenly as possible. Brush on the remaining buffalo sauce and sprinkle evenly with mozzarella. Pop that into the oven for 6 – 8 minutes under the pre-heated broiler. Watch it closely. It’s done when the dough is crisp and the cheese is browned. Remove from oven and immediately sprinkle with the blue cheese as evenly as possible. Slice and serve immediately. Mix the flour and salt in a big bowl, mixing well. Sprinkle the top of the flour with the yeast, then add the wet ingredients and mix together into a big clump. Flour a surface, and dump contents of bowl onto it. Knead everything together until all the ingredients are mixed well. Super Lazy Mel Tip: you can knead the dough right inside the bowl. You may hurt your knuckles a bit, but the clean up is much easier. Pick the dough up, then lightly oil the bowl and place the dough ball inside, coating all sides with oil. Cover the ball tightly with plastic wrap and let the dough rise for at least 2 hours. I let it sit out on the counter all day while Iâ€™m at work and that seems to be fine as well. Knead the dough for a bit to remove the air bubbles (Super Lazy Mel Tip: You can do this in the bowl). Cover with plastic wrap and let stand for 30 more minutes. This is a pretty brilliant recipe. Well done. Wow–that looks like about the most perfect dinner for a nice glass of beer! My favorite food group is pizza. That’s sounds like a fantastic combination. I love blue cheese with sweet potatoes, and putting all of this together is just a great idea. This topic was very informative and well written. I plan to do some more research on this. Thanks for sharing this timely information. We need more like this. I made this last night and it was so delicious!!! Thank you! I have just began with my own site and I really love this template. Is it free or maybe a version of those premium templates? Sorry, I’m new to this and simply looking for suggestions. BTW, I check out your site almost daily. I’m not a pork eater, you guys think some diced chicken breasts tossed in wing sauce would be a good idea for extra protein? exposure! Keep up the fantastic works guys I’ve incorporated you guys to our blogroll.